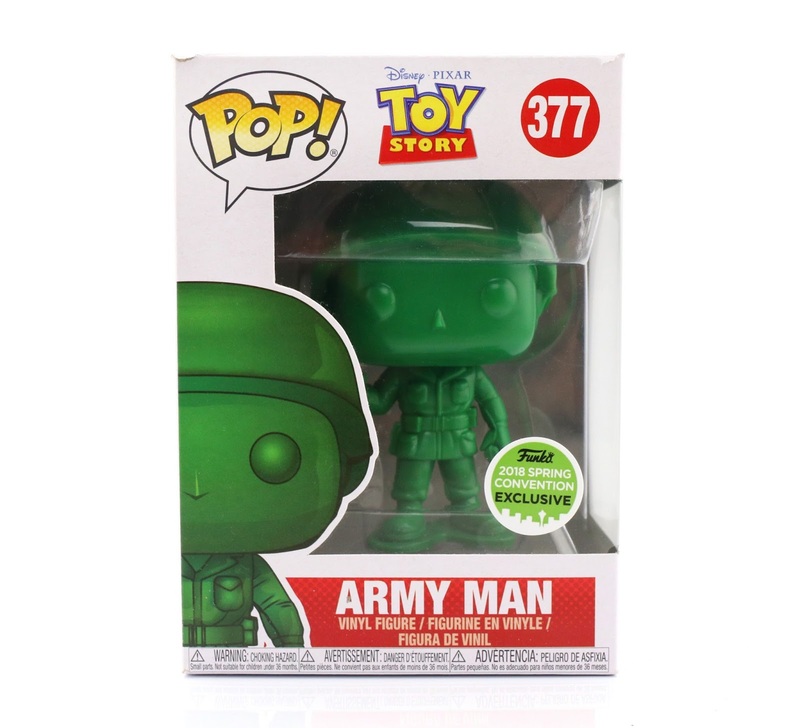 Dan the Pixar Fan: Toy Story: Army Man Funko "POP!" Hey everyone! Sorry for the delay getting posts up this week so far—I know this one was suppose to be yesterday's. This has turned out to be an unexpectedly busy week for me. Here I am though, back regardless! Really excited about this post. Late at night on March 1st, I had sat down at my computer after a long day of work. On social media, I saw people were talking about this release and I realized that I had totally forgotten about it! I rushed onto the BoxLunch website (since I don't have any of those stores in my state) and was relieved to see it was still "in stock". As I was concluding my order, the site kicked me out and told me the item was no longer available. This killed me! I frantically went back to the product page, which did indeed now say "sold out" (such a bummer). I then took to Twitter for research, only to see people complaining about how it had sold out online early in the morning (so yah, in reality I had missed it by like ten hours). Man, wasn't even close. Nonetheless, I went back to the product page to refresh it out of curiosity and, to my surprise, it said "in stock" again! I refreshed again and, what do you know—"sold out." I did this several times, totally confused about what was really going on. With every "refresh", the stock would change from being available to not. Well, to wrap this story up, when it landed on "in stock" again, I attempted once again to put in my order for one. This time it worked and I was able to make it all the way through to the order confirmation page! That was exciting, but I was sure I was going to get an email saying the order was cancelled (since a lot of people were saying that was happening to them). A couple days later I did get an email, but it was good news telling me my order had shipped! I was THRILLED. Not sure how that happened, but hey—I'll take it. Retail price was $15. 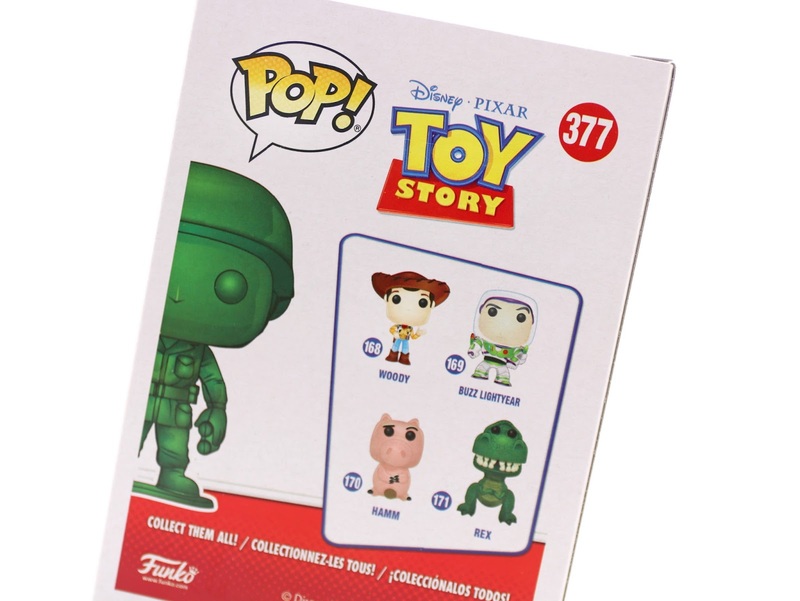 On the front of the box, there's a sticker stating that this is a "Funko Spring 2018 Convention Exclusive" and on the back it shows the latest standard wave of Toy Story POPs. This one is number 377 of the Disney/Pixar series. This guy looks awesome. I love the attention to detail (which was originally Pixar's attention to detail) of the extra "plastic" rings and seams where it would have been cheaply molded together if it were a real army man toy. 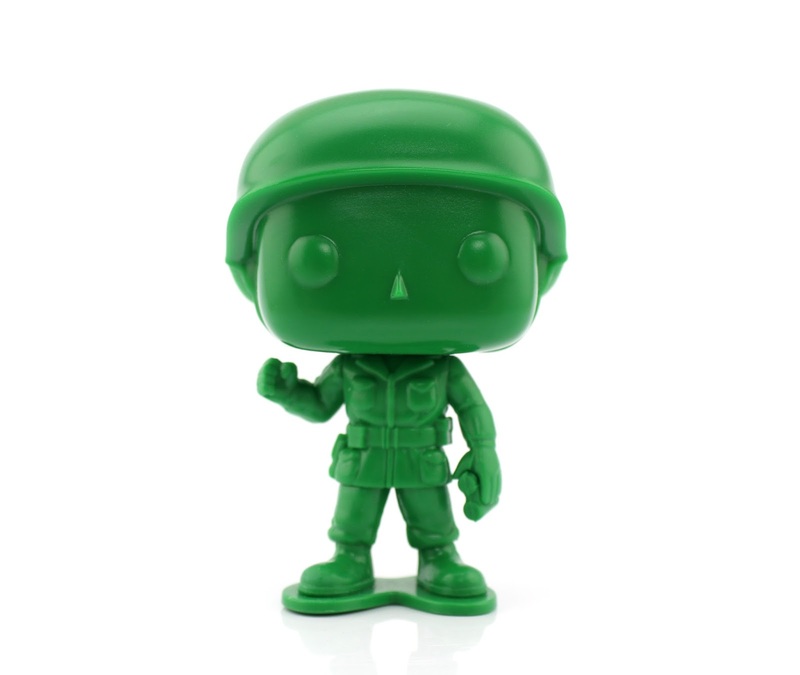 And of course the classic base to which their feet are attached to is another main green army man component, which Funko totally got right. 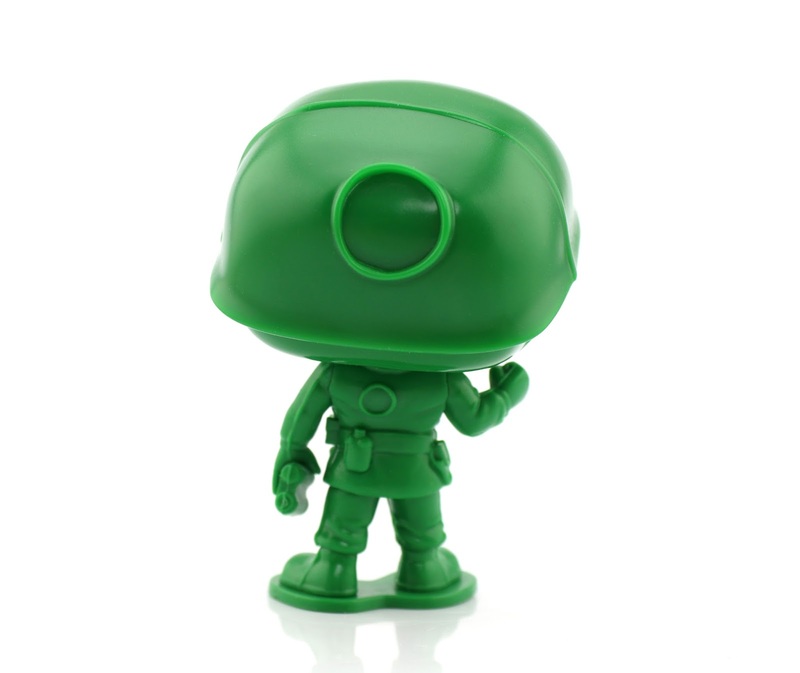 Ultimately, this is an iconic design that was translated really well to Funko's signature style. It's a simple POP! (like the toy it's based on), but a good one and a great addition to the Toy Story line. 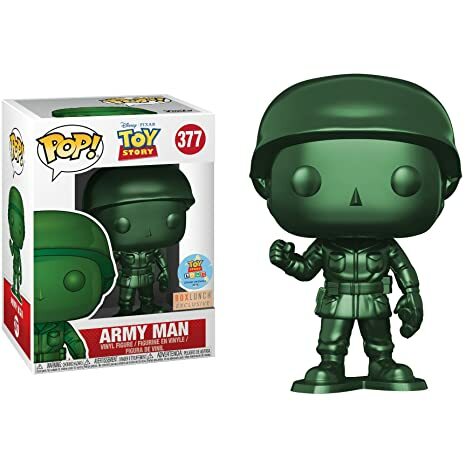 I'm sure many Funko collectors will want an army of these things! For me, I'm good with one. Lastly, if you're into collection variants (which I don't go usually go for), there is a metallic version of this guys as well (buy HERE, also on BoxLunch). On eBay currently, these are selling between $25 and $35 (which isn't too bad for an aftermarket Funko exclusive). I imagine they're completely sold out at all BoxLunch stores, but it wouldn't hurt to call the one closest to you to confirm. I'm also not sure if they'll get restocked (though I doubt it). If you missed this one and would like to add it to your collection (which I totally recommend), you can check out THIS DIRECT LINK to current eBay listings. Let me know your thoughts in the comments below! And remember—a good soldier never leaves a man behind.